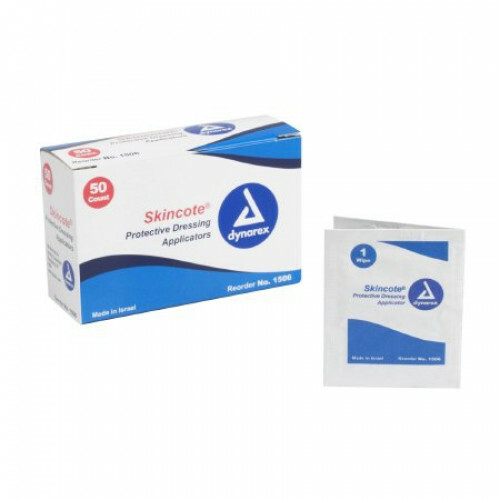 Dynarex Skincote Protective Dressing Applicator comes in a convenient packet to facilitate easy application onto the skin. The individual pre-moistened wipe adds a protective barrier to the skin when wiped onto the skin and then dried before adding tape, adhesives, bandages, external catheters and medical appliances that can cause allergic reactions to the skin. This protective layer buffers between these products like another layer of skin when patient is allergic to latex or adhesives. Skincote is popular among ostomy users because ostomy adhesive, fillers and ostomy barrier appliance may irritate the skin. A standout feature of the Skincote Protective Dressing Applicator is that it doesn't have to be re-applied with every bandage or appliance change. You can buy a single packet to give this product a try. For hospitals and clinics larger quantities are available with a Box of 50 or a Case of 1000.